When Pew Research Center conducted case studies of local news environments in three U.S. cities, one question was whether residents thought the news had changed in recent years and how digital news habits played in that perception. For the news business, there was a good headline: More longtime residents – those who have lived in their city for at least five years – say that the quality of their city’s local news has gotten better than say it has gotten worse. And more think keeping up with local news has gotten easier than harder. It should be noted, though, that about half of longtime residents in the three cities – Denver, Macon, Ga., and Sioux City, Iowa – think their local news is about the same for both quality and ease of access. About four-in-ten longtime residents in Sioux City (40%) and Macon (38%) and about three-in-ten in Denver (29%) say that the quality of local news has gotten better; only a small minority in each city says that it has gotten worse. The same pattern holds for thinking that keeping up with local news is easier; roughly four-in-ten longtime residents in each city say this. When it comes to how easy it is to keep up with the news, one group of longtime residents stands out: those who get at least some of their local news through social media. In all three cities, longtime residents who follow local news via social media are more likely than those who do not to find local news easier to keep up with. This is true compared with both those who get local news digitally but not from social media and those who rarely, if ever, access it digitally. These residents who use social media for news are also more likely than others to rely on different news sources today than they did five years prior. In each city, about four-in-ten longtime residents who get local news on social media say that their sources are now different from five years ago, compared with three-in-ten or less of those who do not. 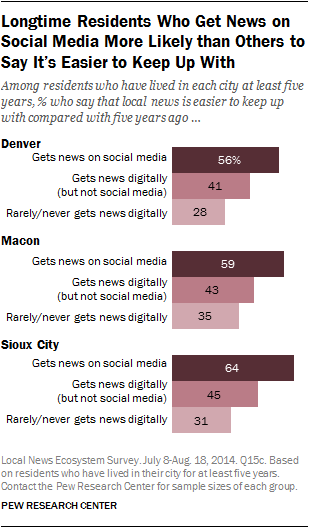 In Denver, for example, 46% of longtime residents who get local news on social media say that the sources they use are different, compared with 30% of those who get news digitally but not on social media and 28% of those who do not get local news digitally. Less of a consistent pattern emerges when it comes to the belief that the quality of their local news has gotten better. In Macon, almost half (46%) of long-term residents who get local news on social media say that local news has improved over the past five years, compared with about one-third of those who get news digitally but not from social media (33%) and non-digital local news followers (35%). There is no significant difference, though, in Denver or Sioux City. While social media use stood out among longtime residents, there are also notable differences in race and ethnicity as well as education. In Macon, blacks are more likely than whites to say local news has gotten better and easier to keep up with, and are more likely to get news from different sources from five years ago. The same is true of Hispanics in Denver in comparison to whites. (Blacks and Hispanics make up too small of portion of the Sioux City population to examine separately.) Additionally, in all three cities those who have a college degree are less likely to say their local news has gotten better in quality. But there are not any notable education differences in the ease of keeping up with local news or getting news from different sources.